Cataracts affect most seniors. Over 50% of those between 75 and 85 have already lost some vision due to a cataract. Older adults, already a risk group for bone fractures, increase their likelihood of falls. Seniors with cataracts have more car crashes. Decreased independence and greater social isolation increase depression incidence. If you or your elderly parent is at risk, you CAN make a difference. Read on. Cloudy vision. It may start with a few blurry spots in your field of vision that don’t go away. Over time, the blurriness spreads. It’s like looking through dirty or foggy glasses. Sensitivity to light and glare. When you’re outside in the sun or your eye catches a bright lamp, it may cause you to squint, to want to close your eyes, or to suffer a headache. Night vision degrades because everything appears to be less bright. For this reason, during the evening or in a dimly lit room, you’re more likely to bump into things, trip or fall down. Halos around lights, caused by diffraction of light in the cataract. Car headlights and street lamps will appear to have circles around them. This is distracting and makes driving dangerous. See your doctor or eye specialist for a test and explain what you’re experiencing. Don’t worry, an eye test is painless. Cataracts tend to get worse over time slowly. Unfortunately, this causes many to not notice the changes, or to disregard the symptoms and delay an examination. Yellowing or fading of colours. Like looking through a yellow lens, the cataract shifts all colours towards yellow. The brain tries to correct, and all colours appear to be muted. Distortion and double vision. Shapes of objects may appear distorted. You may experience double vision if your two eyes cannot merge the left and right fields into a single image. Prescription changes. The need to obtain a new prescription and replace glasses or contact lenses will occur more often. Vision loss. Eventually, everything becomes so cloudy that it is impossible to distinguish between objects. Nuclear sclerotic cataract. The central part of the eye lens, known as the nucleus, slowly hardens and yellows. This is the most common type of cataract, and generally affects older people. Cortical cataract. The outer part of the lens, called the cortex, develops a cloudy opacity. The cataract appears to have lines or triangles from the outside to the inside, like spokes of a bicycle wheel. These cause light to scatter and cause problems with glare, making driving more difficult. Posterior subcapsular cataract. The rear surface of the lens becomes more opaque, causing reading difficulties, glare and light sensitivity. This type of cataract is more common in those with diabetes and develop more quickly, often within months. We can’t stop the clock or reverse aging, but can we prevent cataracts or slow their formation? Smoking oxidizes the lens and may lead to accumulation of heavy metals such as cadmium. If you smoke, try to cut down or quit. Eye injury. Injuries to the eye make it more likely that you will develop a cataract. Hence, wear eye protection while gardening or working with tools. Diabetes. Keep a healthy diet, maintain a healthy weight, cut back on alcohol, exercise regularly and see your doctor for a regular check-up. Sunlight. Long periods of exposure to the ultraviolet light of the sun, without protection, increases your risk. Therefore wear sun glasses while driving, and put on a hat or cap when you step outside. Medications. Some medications, such as corticosteroids, increase the risk or accelerate the development of cataracts. If this is the case, your doctor may be able to switch you to an alternative prescription. Some products claim that they can prevent cataracts. Cataract formation is a natural part of the eye’s aging process. So beware, before you buy vitamins or expensive herbal products, ask your doctor or eye specialist for the latest information. Wearing sun glasses reduces your risk of developing cataracts. Sun glasses can also reduce the glare and discomfort caused by cataracts. Update your prescription. Early-stage cataracts may not warrant surgery but may cause vision distortions that require new glasses or contact lenses, or the use of bifocals. Appropriate lighting. During the evening, switch on lights earlier. On bright sunny days, use the curtains or shutters to reduce halos or glare. 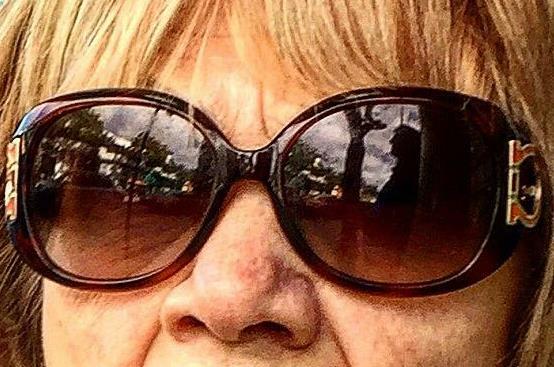 Sun glasses. Prescription sun glasses can both correct vision and reduce glare at the same time. Eye drops to dissolve cataracts are, unfortunately, still in the research stage and are not a cataract cure. At some point, your eye specialist may recommend surgery to remove the cataract. Cataract Surgery. In more severe cases, cataract surgery can be a successful remedy for restoring vision. The cloudy lens of the eye can be replaced with a clear, artificial lens. This is considered to be a safe and effective outpatient procedure; an overnight hospital stay is not required. In fact, surgery takes only about 15 minutes but expect to attend for at least 90 minutes to prepare your eye beforehand, evaluate the operation and instruct you on recovery afterwards. Note that recovery is generally fast but if both eyes have cataracts, the surgeon will wait at least a few days, and up to two weeks, before operating on the second eye. Laser-assisted surgery. Some surgeons use an expensive femtosecond laser to assist during cataract surgery for increased precision and to reduce the need for surgical tools. Studies show that while this can improve accuracy during some steps of the procedure, it may not necessarily improve safety, recovery time or visual outcomes. Ask your eye doctor for the latest information. YAG Laser surgery. After surgical removal of a cataract, over 30% of patients go on to develop a cloudy eye capsule. Note that this can take months or many years, has similar symptoms to a cataract, but is not the same. YAG laser capsulotomy is used to create a small opening in the eye capsule to provide a clear path for light. The procedure is painless and the improvement is almost immediate. Cataract surgery is now a very common treatment. Recovery is fast but requires some care following the procedure. Anesthesia recovery. During your recovery from the anesthetic, you may be asked to stay where staff, or your friend or family member, can observe you. Don’t drive. Bring someone with you to take you home after surgery. Don’t try to drive until after the post-surgical consultation with your eye doctor, which will generally be the next day. At this point, your eye doctor will test your vision before giving you the OK to drive. Avoid strain. No heavy lifting or strenuous activity for one week. Moreover, don’t exercise and be careful while bending to avoid stress on your healing eye. This is definitely the time to ask your family and friends for help. Eye shield. For about one week, you’ll use an eye shield to help protect your eyes while you sleep or take a nap. Sun glasses. For protection against sunlight and strong indoor lighting, you’ll wear a pair of special post-operative sun glasses. Avoid water. Water can increase the risk of infection. Therefore, shut your eye while bathing or showering during the first week. Avoid swimming pools and hot tubs for two weeks. Keep it clean. Avoid dust, dirt and contaminants. This is your excuse to delay the gardening and cleaning, or ask the children for help. 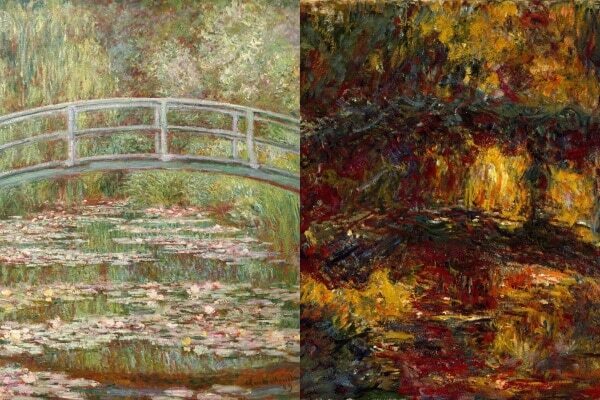 If you’re an active person like the famous painter Claude Monet, you’re likely to become frustrated during recovery. Give yourself the time and space to allow your eyes to fully heal. Eye drops. For several weeks, you’ll use prescription eye drops, a few times each day. Redness and blurry vision might be experienced for a few days or even a few weeks. Wear glasses. You may need a new prescription or, in some cases, none at all. Your eye doctor may suggest you wear progressive lenses after surgery to get the best possible vision over all distances. Even if you don’t need lenses, you may wear glasses for additional protection. If you have any questions or if your recovery doesn’t go as planned, be sure to call your eye doctor. Grab handles. Install handles above the bath, in the shower cubicle and beside the toilet. Rails. Add stair rails if you have stairs leading to the front door, rear door, side door, along the garden path or from the driveway. Ramps. Build in gentle ramps, if possible, either beside stairways or to replace stairways. Paving. Garden beds, lawns and paths can be uneven and bumpy. Install paving or paver stones. Declutter the home by storing, discarding or selling what you don’t use and don’t need. Remove furniture or objects that are not required to provide wider, clearer walking paths in the home. Many everyday appliances require sharp eyes and the dexterity of a ninja. A failing memory can compound the problem. In contrast, increasing independence can promote self confidence and self esteem, which are vital for reducing depression risk, and can help an elderly person continue to live independently. Remotes. Most televisions come with a black remote control with dozens of tiny black buttons, most of which you never use. Get a seniors TV remote with a few huge buttons. Alternatively, ask a young nephew to program up a learning remote to automate just the functions that you use, with minimal button presses. Instructions. Provide easy instructions for appliances such as dishwashers, washing machines, stoves, ovens and microwave ovens. We’ve seen homes in which every appliance has been adorned by a family member with printed simplified instructions. If an appliance is getting old or too hard to use, consider replacing it with one that has controls with huge text. Telephone. Replace the landline telephone with a seniors phone, with programmable memory keys for important contacts. Video phone. Frequent face-to-face conversation has been shown to decrease depression risk and increase cognitive ability. However with failing eyesight, using a computer tablet to run Skype or Facetime can be challenging. 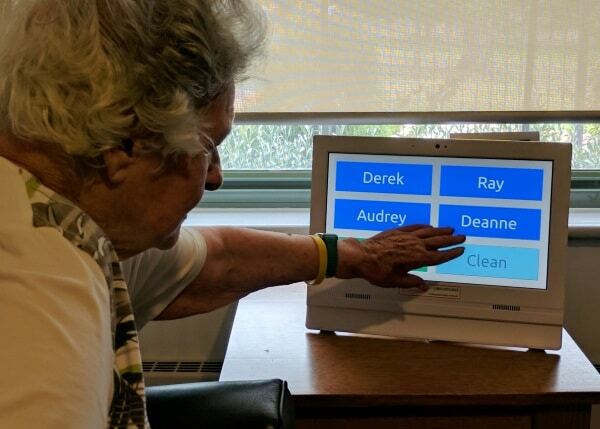 A seniors video phone enables visual contact more often without the travel. 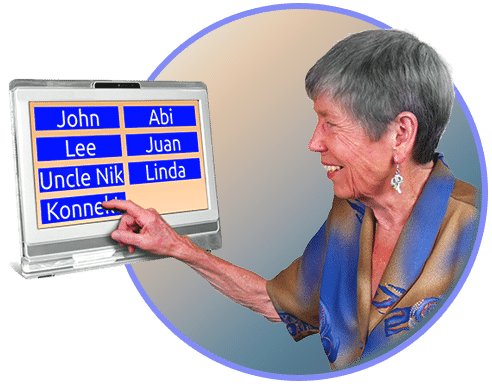 The Konnekt Videophone is incredibly easy-to-use, features a 15-inch high-contrast screen and huge 6-inch buttons to dial family members and friends by name with just one touch. Poor vision makes simple daily tasks hazardous or impossible. It gets in the way, takes away some of the simple pleasures in life, and causes us to rely on others. Loss of independence has a huge impact on confidence, self-esteem and happiness. As our vision declines with age or due to cataracts, travel becomes difficult. Driving, walking and public transport become increasingly dangerous. We tend to stay at home rather than risk visiting family and friends. Social isolation and loneliness are linked to poor sleep, high blood pressure, depression, dementia and morbidity. Read how social isolation impacts the elderly. Frequent face-to-face contact with family and friends has been shown in studies to reduce social isolation, halve depression risk and increase cognitive ability. 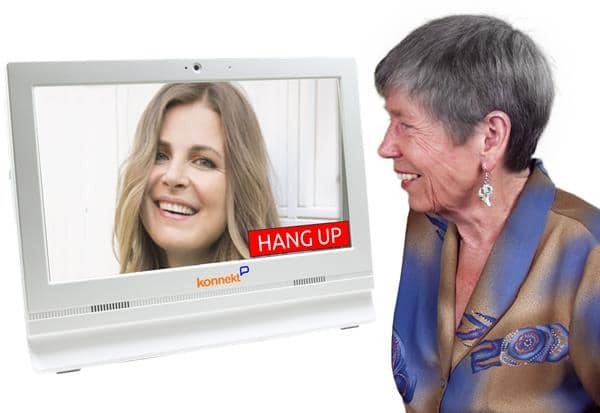 Find out how Konnekt Videophone works. To trial a Videophone, just contact us and we’ll do the rest.